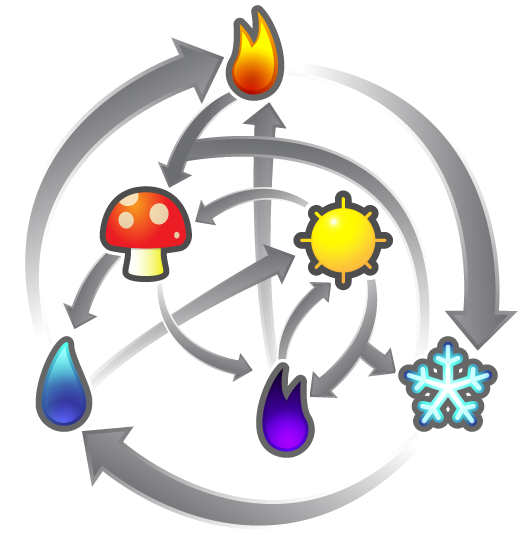 The spirit world is divided into six known elements; fire, ice, water, shadow, light and fungal. Each element has strengths and weaknesses relative to each other. For example fire users are strong against ice users but weak against water ones. Every ability and spirit is aligned to an element so you’ll need to choose your attacks wisely! NB: Some attacks can be used regardless of what element you are but some of the really special ones can only be used by players of that particular element! At level 25 you can purchase a second elemental alignment and change between each outside of battle. At various points from then on you can purchase the remaining elemental alignments!